Responding to the clarion call for the world’s community of faiths to actively participate in the global challenge of improving the lives and welfare of children, the Religions for Peace, Philippines (RfPPhil), the Catholic Bishops’ Conference of the Philippines-Episcopal Commission on Inter-Religious Dialogue (CBCP-ECID) and UNICEF Philippines recently came together in a collective effort to celebrate the National Day of Prayer and Action for Children in Makati City. They enjoin the government, private businesses, civil society, international partners, child-rights advocates, and all the different faiths to be part of this undertaking and work together towards promoting child survival and maternal health and take actions towards promoting, supporting and protecting the national breastfeeding policy as a means to improving child survival and nutritional status. 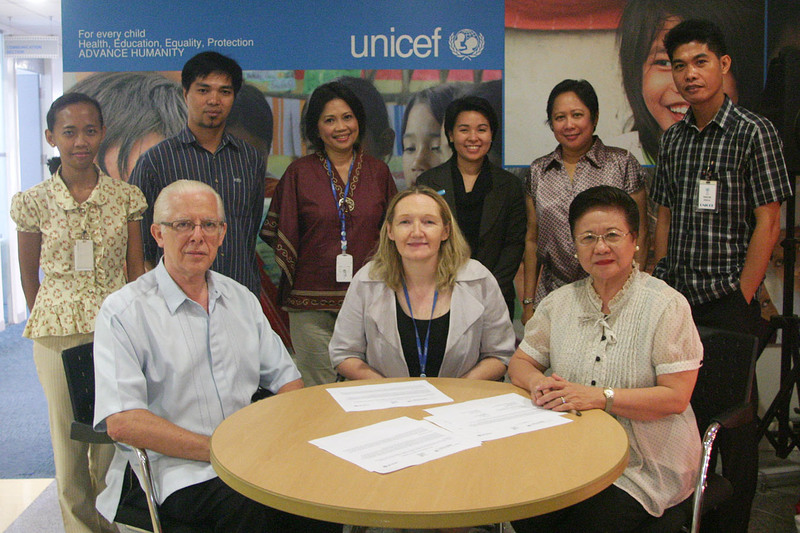 Present during the signing of the joint communiqué were (standing from left): Eileen Aquino; Ted Francisco, Communication and Advocacy Specialist UNICEF; Dr. Marisa Ricardo, Health Specialist, UNICEF; Dr. Pura Rayco-Solon, Nutrition Specialist, UNICEF; Bong Baybado, CBCP Representative; (seated from left) Fr. Luke Moortgat of CBCP Episcopal Commission on Health Care; Vanessa Tobin, UNICEF Country Representative; and Dr. Lilian Sison of Religions for Peace, Philippines.